How A 2-Day Event On Strengthening Women's Business Sense Reflected the Power Of Sisterhood! We saw the realities of capabilities. We saw reflections of dreams. We experienced the makings of herstory, and myriad of feminine possibilities. Yes, we could! And yes, we can! The fascination of Entreprenelle ME’s first ever, She Can (2018) was the business of womanhood. Literally! Held from March 2-3, 2018, feminine wonders were everlasting. From Cairo, Upper Egypt, and other sectors of the country; Egyptian women entrepreneurs (and those in training) experienced the realm of business, in a more feminine touch. Through founder, Rania Ayman, Entreprenelle ME embarked on the journey of enriching the successes of Egyptian women business owners and entrepreneurs. Leave outdated models of competition behind. For the women of Entreprenelle ME and She Can (2018), strong alliances, healthy networking environments, and women seeing themselves as their own best resource, is the true essence of business sense. Business sense as common sense! For Entreprenelle ME, and their extensive work in improving the rate of more successful, Egyptian women business owners, business is no longer a “dog-eat-dog” world. Rather, business growth and development is transformed into art-with a more feminine touch! Much of Entreprenelle ME’s work includes (though is not limited to) the following fruits: connecting early, Egyptian women, business owners with financial resources for starting up a business; training courses/programs for running a business; and connecting women entrepreneurs in building a supportive base. So, on the days of She Can 2018 (in the Downtown/Tahrir Greek campus), the phenomenon of women getting down to business, took place. Speaker after speaker-from leading, Egyptian-Arab professional women, their male counterparts, highlighted with the trinkling of foreign voices-spoke to attendees of women. Those coming to be inspired, while seeing themselves, as the image of active business. Decorating the Greek campus were booths and presentations of Egyptian-owned, women businesses; products and services they wished to provide. From homemade handicrafts, feminine soaps and oils, and countless other treats; no one can say that festivities did not cater to women. Yet, one of the silent activities (experienced by the writer on March 3, 2018), was the bonding of Sisters. The recognition of women, by women. Knowing that in business, backing women means our Sister will have our back. This safety net, grown in the garden of Entreprenelle ME, makes business flourishing and fun. 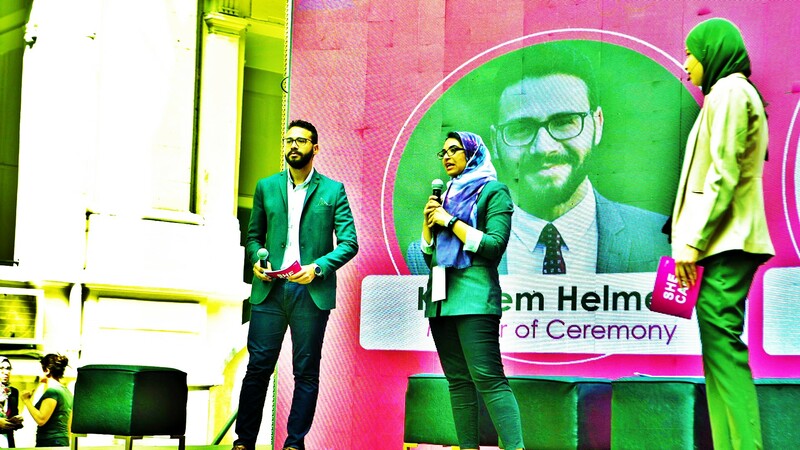 In celebration of women’s business saavy in Egypt (and the international alliances, being made with foreign sisters), She Can was also a space where women could celebrate the successes, improvements, and start-ups of each other. Even more precious, was the satisfaction and natural therapy of being in the company of fellow, creative women. Women who channel feminine energy into productivity, abundance, enrichment, and ever-growing fruition with others. For Entreprenelle ME to have the event in gardenal (and water) spacing, is metaphorical genius for the reflection of women’s artistry in business. Evergrowing, achieving balance; while intertwining with other creative, feminine energies. The naturalness of womanhood when creating or producing anything with other women. Even more invigorating is that one can simply relax, appreciate, and be appreciated with other women. Hearing the words of prominent, professional, and leading Egyptian-Arab women speaking on their challenges, and desires to stand out, was a testament to a Soulful healing. . .in every coloration of the phrase. It was a boisterous statement to Egypt, and to attendees of the international community; that Egyptian womanhood continues to be a vigilant pattern, on the international quilt of women’s ongoing attempts to restore balance and healing to society-all through the methods of business and finance. Meeting producer and director for the filming of She Can 2018, Sally Abo Basha,was another added bonus. It’s a euphoric feeling to come in contact with fellow women writers, creative/artistic directors, and photographers, at women-celebratory events. Afterall, who can capture and articulate the narrative of business flowers than women? Who can capture the presence of women at a particular time, and moment of herstory, better than women? That was another fruitful component of She Can 2018! How women, and supportive men, photograph and paint the words describing the movement of women, is the cornerstone of cementing a successful conclusion to an auspicious event. Pictures exert the emotions and tone of the environment. Writing illuminates the energies, exalted by attendees and visitors to the garden. It can be tedious work. Yet, it is necessary in channeling this energy for future, She Cans! Having been part of one day of the festivities, one couldn’t help, but to get a concluding picture with ladies of Entreprenelle, themselves. Being painted with pioneering woman, Rania Ayman, breathed testaments of future encounters. Those are inevitable. Then, there are the moments with another “She” of Entreprenelle ME. One can only imagine the long hours, all nighters, and unlimiting perseverance of Entreprenelle ME’s fabulous organizers. Work, that never ends. Like the endless tasks of washing machines; needing to clean, steam, spin, and rinse out, all over again. Leading up to a more lavish, gardenal party for 2019! One with more flowers, expansion of previous projects; the telling of more women oratoricals, who made it in the entrepreneur and business scenes. A wonderous expansion for a larger business garden, at hand. We could. . .with countless “yes’s” to plan! For she could, if she would, BELIEVE that. . .She Can!